The Times of India (TOI) is an Indian English-language daily newspaper owned by The Times Group It is the third-largest newspaper in India by circulation and largest selling English-language daily in the world according to Audit Bureau of Circulations (India). It is the oldest English-language newspaper in India still in circulation, albeit under different names since its first edition published in 1838. It is also the second-oldest Indian newspaper still in circulation after the Bombay Samachar. Near the beginning of the 20th century, Lord Curzon, the Viceroy of India, called The Times of India "the leading paper in Asia". In 1991, the BBC ranked The Times of India among the world's six best newspapers. It is owned and published by Bennett, Coleman & Co. Ltd. (B.C.C.L. ), which is owned by the Sahu Jain family. In the Brand Trust Report 2012, The Times of India was ranked 88th among India's most-trusted brands. In 2017, however, the newspaper was ranked 355th. The Times of India issued its first edition on 3 November 1838 as The Bombay Times and Journal of Commerce. The paper published Wednesdays and Saturdays under the direction of Raobahadur Narayan Dinanath Velkar, a Maharashtrian Reformist, and contained news from Britain and the world, as well as the Indian Subcontinent. J.E. Brennan was its first editor. In 1850, it began to publish daily editions. In 1860, editor Robert Knight (1825–1892) bought the Indian shareholders' interests, merged with rival Bombay Standard, and started India's first news agency. It wired Times dispatches to papers across the country and became the Indian agent for Reuters news service. In 1861, he changed the name from the Bombay Times and Standard to The Times of India. Knight fought for a press free of prior restraint or intimidation, frequently resisting the attempts by governments, business interests, and cultural spokesmen and led the paper to national prominence. In the 19th century, this newspaper company employed more than 800 people and had a sizeable circulation in India and Europe. Subsequently, The Times of India saw its ownership change several times until 1892 when an English journalist named Thomas Jewell Bennett along with Frank Morris Coleman (who later drowned in the 1915 sinking of the SS Persia) acquired the newspaper through their new joint stock company, Bennett, Coleman & Co. Ltd.
Sir Stanley Reed edited The Times of India from 1907 until 1924 and received correspondence from the major figures of India such as Mahatma Gandhi. In all he lived in India for fifty years. He was respected in the United Kingdom as an expert on Indian current affairs. He christened Jaipur as "the Pink City of India". Bennett Coleman & Co. Ltd was sold to sugar magnate Ramkrishna Dalmia of the then-famous industrial family, the Dalmiyas, for Rs 20 million in 1946, as India was becoming independent and the British owners were leaving. In 1955 the Vivian Bose Commission of Inquiry found that Ramkrishna Dalmia, in 1947, had engineered the acquisition of the media giant Bennett Coleman & Co. by transferring money from a bank and an insurance company of which he was the Chairman. In the court case that followed, Ramkrishna Dalmia was sentenced to two years in Tihar Jail after having been convicted of embezzlement and fraud. But for most of the jail term he managed to spend in hospital. Upon his release, his son-in-law, Sahu Shanti Prasad Jain, to whom he had entrusted the running of Bennett, Coleman & Co. Ltd. rebuffed his efforts to resume command of the company. In the early 1960s, Shanti Prasad Jain was imprisoned on charges of selling newsprint on the black market. And based on the Vivian Bose Commission's earlier report which found wrongdoings of the Dalmia – Jain group, that included specific charges against Shanti Prasad Jain, the Government of India filed a petition to restrain and remove the management of Bennett, Coleman and Company. Based on the pleading, Justice directed the Government to assume control of the newspaper which resulted in replacing half of the directors and appointing a Bombay (now Mumbai) High Court judge as the Chairman. Following the Vivian Bose Commission report indicating serious wrongdoings of the Dalmia–Jain group, on 28 August 1969, the Bombay High Court, under Justice J. L. Nain, passed an interim order to disband the existing board of Bennett Coleman and to constitute a new board under the Government. The bench ruled that "Under these circumstances, the best thing would be to pass such orders on the assumption that the allegations made by the petitioners that the affairs of the company were being conducted in a manner prejudicial to public interest and to the interests of the Company are correct". Following that order, Shanti Prasad Jain ceased to be a director and the company ran with new directors on board, appointed by the Government of India, with the exception of a lone stenographer of the Jains. Curiously, the court appointed D K Kunte as Chairman of the Board. Kunte had no prior business experience and was also an opposition member of the Lok Sabha. In 1976, during the Emergency in India, the Government transferred ownership of the newspaper back to Ashok Kumar Jain (Sahu Shanti Prasad Jain's son, Ramkrishna Dalmia's grandson and the father of Samir Jain and Vineet Jain). The Jains too often landed themselves in various money laundering scams and Ashok Kumar Jain had to flee the country when the Enforcement Directorate pursued his case strongly in 1998 for alleged violations of illegal transfer of funds (to the tune of US$1.25 million) to an overseas account in Switzerland. On 26 June 1975, the day after India declared a state of emergency, the Bombay edition of The Times of India carried an entry in its obituary column that read "D.E.M. O'Cracy, beloved husband of T.Ruth, father of L.I.Bertie, brother of Faith, Hope and Justice expired on 25 June". The move was a critique of Prime Minister Indira Gandhi's 21-month state of emergency, which is now widely known as "the Emergency" and seen by many as a roundly authoritarian era of Indian government. In late 2006, Times Group acquired Vijayanand Printers Limited (VPL). VPL previously published two Kannada newspapers, Vijay Karnataka and Usha Kiran, and an English daily, Vijay Times. Vijay Karnataka was the leader in the Kannada newspaper segment then. The paper launched a Chennai edition, 12 April 2008. It launched a Kolhapur edition, February 2013. Introduced in 2013 and awarded for the second time in 2016, "The Times of India Film Awards" or the "TOIFA" is an award for the work in Film Industry decided by a global public vote on the nomination categories. TOI's first office is opposite the Chhatrapati Shivaji Terminus in Mumbai where it was founded. The Times of India is published by the media group Bennett, Coleman & Co. Ltd. The company, along with its other group of companies, known as The Times Group, also publishes Ahmedabad Mirror; Bangalore Mirror; Bangalore Times, Delhi Times; The Economic Times; ET Panache (Mumbai, Delhi, Bengaluru on Monday to Friday, and as Times of India ET Panache in Pune and Chennai, every Saturday) Ei Samay, (a Bengali daily); the Maharashtra Times, (a Marathi-language daily broadsheet); Mumbai Mirror; the Navbharat Times, (a Hindi-language daily broadsheet); and Pune Mirror. The Times of India has its markets in major cities such as Mumbai, Ahmedabad, Allahabad, Aurangabad, Bangalore, Bhopal, Bhubaneswar, Calicut, Chandigarh, Chennai, Coimbatore, Delhi, Guwahati, Hubli, Hyderabad, Indore, Jaipur, Kochi, Kolhapur, Kolkata, Lucknow, Madurai, Mangalore, Mysore, Nagpur, Nashik, Panaji, Patna, Puducherry, Pune, Raipur, Ranchi, Surat, Trichy, Trivandrum, Varanasi, Vijayawada and Visakhapatnam. Speaking Tree: A spiritual network intended to allow spiritual seekers to link spiritual seekers with established practitioners. Healthmeup: A health, diet, and fitness website. Cricbuzz: In November 2014, Times Internet acquired Cricbuzz, a website focused on cricket news. Under an ad sales initiative called Medianet, if a large company or Bollywood studio sponsored a news-worthy event, the event would be covered by the Times of India but the name of the company or studio that sponsored it will not be mentioned in the paper unless they paid the Times of India for advertising. In 2010, a report by a subcommittee of India's Press Council found that Medianet's paid news strategy had spread to a large number of newspapers and more than five hundred television channels. In 2005, a program called “private treaties” or “brand capital” was introduced under which the Times of India accepts ads in exchange for real-estate ownership or equity in a company. B.C.C.L. has become one of the largest private equity investors in India with stakes ranging from 1 per cent to 15 per cent across 140 companies. This ads-for-equities model accounts for up to fifteen per cent of its ad revenues and is being followed by other media houses. Critics have claimed that the company’s paid news and private treaties skew its coverage and shield its newspaper advertisers from scrutiny. The Hoot, a media criticism website, has pointed out that when an elevator in a 19 storey luxury apartment complex in Bangalore crashed killing two workers and injuring seven, all the English language and Kannada language newspapers with the exception of the Times of India called out the name of the construction company, Sobha Developers, which was a private-treaty partner. An article titled “reaping gold through bt cotton,” which first appeared in the Nagpur edition of the Times of India in 2008, reappeared unchanged in 2011, this time with a small print alert that the article was a "marketing feature". In both times the article was factually incorrect and made false claims about the success of Monsanto's genetically modified cotton. In 2005, when the Honda Motors plant in Gurgaon experienced an eight-month-long conflict between management and non-unionized workers over wages and work conditions, provoking violence and charges of police brutality, the Times of India covered the concerns of Honda and the harm done to India’s investment climate and largely ignored the issues raised by workers. Vineet Jain, Managing Director of B.C.C.L., has insisted that a wall does exist between sales and the newsroom, and that the paper does not give favorable coverage to the company’s business partners. “Our editors don’t know who we have,” Jain said, although he later acknowledged that all private-treaty clients are listed on the company’s Web site. Ravindra Dhariwal, the CEO of B.C.C.L. has defended private treaties in a 2010 interview with the magazine Outlook and claims that the partners in the private treaties sign contracts where they agree to clauses that they will not receive any favorable editorial coverage. There have been claims that The Times of India would strike deals with advertisers only if they removed their advertisements from other competitor newspapers. The Times of India is also embroiled in an active lawsuit against the Financial Times. In 1993, when the Financial times was preparing to enter the Indian market, Samir Jain the Vice-Chairman of B.C.C.L. registered the term "Financial Times" as a trademark of his company and declared it his intellectual property in an attempt to stymie the Financial Times and prevent them from competing with the Economic Times which is owned by B.C.C.L. In 1994, when the Hindustan Times was the top-selling paper in New Delhi, the Times of India slashed their prices by a third, to one and a half rupees after having built up their ads sales force in preparation for the price drop to make up for the lost circulation revenue. By 1998, the Hindustan Times had dropped to second place in Delhi. The Times of India took a similar strategy in Bangalore where they dropped the price to one rupee despite protests from Siddharth Varadarajan, one of the editors of the newspaper at the time, who called the strategy "predatory pricing". In 2018, Vineet Jain, Managing Director of B.C.C.L., and Sanjeev Shah, executive president of B.C.C.L., were caught on camera as part of an undercover sting operation by Cobrapost agreeing to promote Hindutva content through the group’s many media properties for a proposed spend of ₹500 crore, some of which the client said could only be paid with black money. B.C.C.L. has responded to the sting claiming that the video that was released by Cobrapost was incomplete and doctored and that Vineet Jain was engaged in a counter-sting of his own to expose the undercover reporter during the filming of the video. Shashi Tharoor, Columnist of "Shashi on Sunday". Twinkle Khanna, Columnist of "Mrs. Funnybones". ^ a b "Submission of circulation figures for the audit period Jul –Dec 2017" (PDF). Audit Bureau of Circulations. Retrieved 21 August 2018. ^ C. S. Natarajan (13 February 2018). National Words: A Solution to the National Language Problem of India. Notion Press. pp. 189–. ISBN 978-1-948147-14-9. ^ Arnold P. Kaminsky; Roger D. Long, Ph.D. (23 September 2011). India Today: An Encyclopedia of Life in the Republic [2 volumes]: An Encyclopedia of Life in the Republic. ABC-CLIO. pp. 706–. ISBN 978-0-313-37463-0. Retrieved 20 April 2018. ^ "It's the best of Times". Rick Westhead. The Star. 5 February 2010. Retrieved 20 April 2018. ^ a b c d e f g h i j k "Citizens Jain Why India's newspaper industry is thriving". Ken Auletta. New Yorker. 8 October 2012. Retrieved 20 April 2018. ^ "National Newspapers Total Circulation". International Federation of Audit Bureaux of Circulations (IFABC). 2011. Retrieved 10 November 2014. ^ S. B. Bhattacherje (1 May 2009). Encyclopaedia of Indian Events & Dates. Sterling Publishers Pvt. Ltd. p. A126. ISBN 978-81-207-4074-7. Retrieved 23 June 2016. ^ Sangita P. Menon Malhan (25 July 2013). The TOI Story. HarperCollins Publishers India. pp. 1945–. ISBN 978-93-5029-664-6. Retrieved 22 July 2017. ^ Jaideep Bose (23 April 2013). "A daily in the life of India". 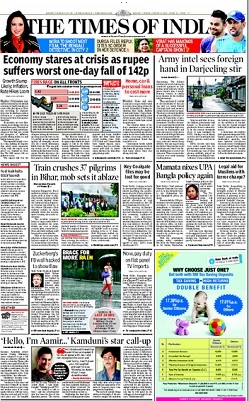 Times of India. Retrieved 23 July 2017. ^ C. V. Baxi; Ajit Prasad (2005). Corporate Social Responsibility: Concepts and Cases : the Indian Experience. Excel Books India. pp. 167–. ISBN 978-81-7446-449-1. Retrieved 26 June 2016. ^ Vir Bala Aggarwal; V. S. Gupta (1 January 2001). Handbook of Journalism and Mass Communication. Concept Publishing Company. pp. 128–. ISBN 978-81-7022-880-6. Retrieved 26 June 2016. ^ "The Brand Trust Report, India Study 2017". Trust Research Advisory. Retrieved 8 January 2018. ^ "The Times of India". Encyclopædia Britannica. 15 April 2013. Retrieved 10 November 2014. ^ a b "The Times of India turns the Times of Colour". Televisionpoint.com. 30 April 2006. Archived from the original on 12 October 2007. Retrieved 16 October 2007. ^ Asima Ranjan Parhi (2008). Indian English Through Newspapers. Concept Publishing Company. pp. 32–. ISBN 978-81-8069-507-0. ^ Rangaswami Parthasarathy (1989). Journalism in India: from the earliest times to the present day. Sterling Publishers. p. 273. Retrieved 26 June 2016. ^ Hirschmann, Edwin (2008). Robert Knight: Reforming Editor in Victorian India. Oxford University Press. ISBN 978-0-19-569622-6. ^ Kartar Lalvani (10 March 2016). The Making of India: The Untold Story of British Enterprise. Bloomsbury Publishing. pp. 383–. ISBN 978-1-4729-2484-1. Retrieved 26 June 2016. ^ Asha Kasbekar (January 2006). Pop Culture India! : Media, Arts, and Lifestyle. ABC-CLIO. pp. 112–. ISBN 978-1-85109-636-7. Retrieved 27 June 2016. ^ "This is why Times of India is pro-Congress, Jain brothers owe their wealth to Gandhis". OpIndia.com. 15 December 2014. Retrieved 4 May 2015. ^ "Indian Millionaires arrested". Reuter (The Herald (Glasgow)), 5 May 1964. Retrieved 6 May 2015. ^ Khandekar, Vanita Kohli (9 November 2013). The Indian Media Business. Mumbai: SAGE Publications. ISBN 978-8132113560. ^ P. Menon Malhan, Sangita (2 August 2013). THE TOI STORY: How A Newspaper Changed The Rules Of The Games. Noida: HarperCollins Publishers India. p. 212. ISBN 9789350296646. Retrieved 3 May 2015. ^ Subramanian, Samanth (1 December 2012). "Supreme Being: How Samir Jain created the modern Indian newspaper industry". The Caravan. Retrieved 10 November 2014. ^ "Trying times: Editorial changes in The Times of India raise disturbing questions". India Today. 7 July 1997. Retrieved 10 November 2014. ^ "Ashok Jain arrested". The Indian Express. 4 July 1998. Retrieved 18 May 2013. ^ Mahalingam, Sudha (18–31 July 1998). "Ashok Jain is arrested by the Enforcement Directorate". Frontline. ISSN 0970-1710. Retrieved 10 November 2014. ^ "A newspaper scandal: Editorial changes in The Times of India raise disturbing questions". Frontline. 6–19 June 1998. Retrieved 10 November 2014. ^ Austin, Granville (1999). Working a democratic constitution: the Indian experience. Oxford University Press. p. 295. ISBN 978-0195648881. (Subscription required (help)). ^ "New book flays Indira Gandhi's decision to impose Emergency". IBN Live News. 30 May 2011. Retrieved 10 November 2014. ^ Desai, Akshayakumar Ramanlal (17 November 1986). Violation of Democratic Rights in India. Bombay: Popular Prakashan. p. 208. ISBN 978-0861321308. Retrieved 10 November 2014. ^ "Times Group acquires Vijayanand Printers". The Times of India. 15 June 2006. Retrieved 10 November 2014. ^ "TN CM launches Chennai edition of Times of India". The Economic Times. 13 April 2008. Retrieved 10 November 2014. ^ "TOIFA 2013 nominations". timesofindia.indiatimes.com. Retrieved 17 July 2016. ^ "TOIFA 2016: 'Bajirao Mastani' Bags 6 Awards, Celebs Have a Rocking Night". India-West. 21 March 2016. Archived from the original on 22 May 2016. Retrieved 17 July 2016. ^ "About TOI Film Awards 2016". timesofindia.indiatimes.com. Retrieved 17 July 2016. ^ "Online Mumbai Newspaper". Mid Day. 24 April 2014. ^ "Times Internet launches Hindi version of 'Speaking Tree'". Exchange4Media. 17 April 2014. Retrieved 1 November 2017. ^ Pahwa, Nikhil (17 March 2011). "Indiatimes Launches Health Blog – HealthMeUp". Medianama. Retrieved 1 November 2017. ^ "Times Internet acquires cricbuzz". The Times of India. Retrieved 15 August 2015. ^ "50 Powerful People". IndiaToday. ^ "At the Times Group, Cobrapost Sting Shows How Cash is King". The Wire. ^ "Times Group Says Vineet Jain Was Conducting 'Reverse Sting' on Cobrapost". The Wire. Auletta, Ken: "Citizens Jain – Why India's Newspaper Industry is Thriving". The New Yorker, 8 October 2012, Pages 52 to 61. Wikimedia Commons has media related to The Times of India.